You’ve probably already seen our latest collection, which features the work of brilliant letterer and illustrator, Risa Rodil. I’ve adored Risa’s work since I first came across her Instagram account last year. When I decided to commission someone to illustrate Eden Street’s motto, she was numero uno on my artist wish list—and here we are! Before I share my brief chat with Risa, here’s why I ended up getting her as a guest artist. I knew that I wanted to add illustrated or hand-lettered items to Eden Street’s portfolio, and that I could (try to) make them myself. At the same time, I knew it would take me a long time to draw or letter a design I’d be very happy with, and I knew I wanted those illustrated products soon. The business decision was easy and instantaneous: Ask someone else to do it! Get help! Collaborate! I knew Risa would bring my vision to life much, much better than I could, and boy, did she ever. She turned my words into a magical piece of visual art. I really love this design and I hope you do, too! Here are some of Risa's thoughts on the design she created for us. Eden Street: Hey, Risa! 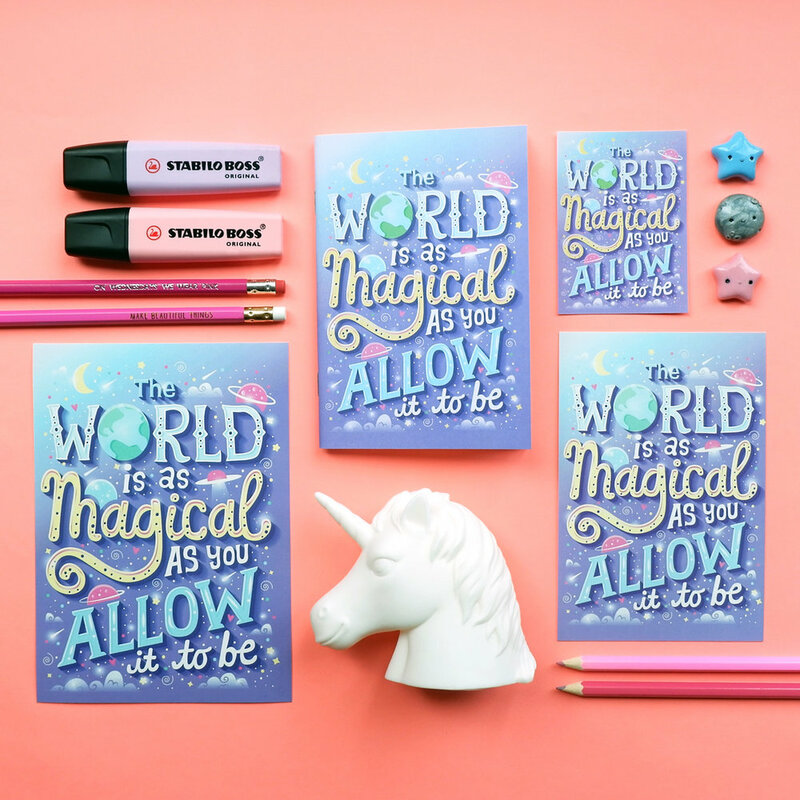 We asked you to illustrate the statement "The world is as magical as you allow it to be." We like to call it our “core statement,” and we love that it can be interpreted in many different ways. What's your own take on it? Risa Rodil: A little shift in perspective can help us see the world in a whole new light. I always try to remind myself that I can choose to make the most out of my life and live it the way I want to—in my own perfectly imperfect way. ES: How do you personally allow the world to be magical for you? ES: Briefly, what's your usual process when coming up with a design? RR: I usually start by gathering design pegs and color inspiration. These help me visualize how I want the design to look like. From there, I’ll go ahead and build the sketch, lock up the composition, mix colors, refine the letters, and finally, add in the final touches, such as highlights, shadows, and gradients. ES: What was your favorite part of creating this design for us? RR: I heavily enjoyed adding all the little details. For this one, I especially loved the part where I sprinkled the background with stars and threw in some planet illustrations, too. Basically, I just loved the whole process of making the design super sparkly. ES: What are you most excited about in your life right now? RR: This November, I’m reuniting with my sister whom I haven’t seen in over a year! Risa Rodil is a designer, letterer, and illustrator. She’s a typical pop culture designerd who pulls inspiration from books, travels, TV, and film. Her work revolves around handcrafted typography and retro illustrations. Personally, I think Risa is just as sparkly as the beautiful illustration she did for Eden Street. You can find more of her work on her website, risarodil.com, and on her Instagram page, @risarodil. Risa's gorgeous artwork is available as a sticker, a pocket notebook, a 4x6 postcard, and a 5x7 art print. Buy them here on our site, or at both branches of Common Room.